My guess is some kind of sparrow. Little brown birds all look the same to me. 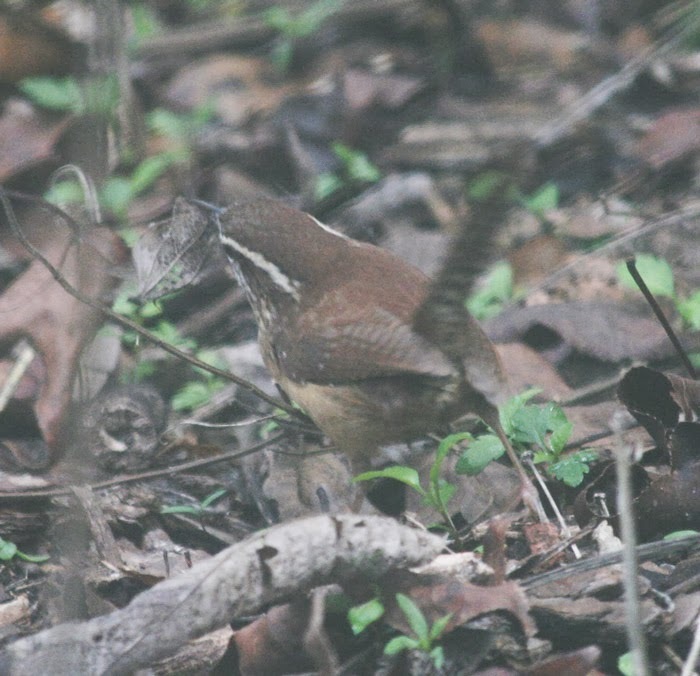 You've got yourself a little brown Carolina Wren. They love wooded areas and have a sweet, rolling song that sounds a bit like "teakettle, teakettle, teakettle". That's exactly the one... I just looked it up. Bonus: it's an insectivore. Perfect! Thank you. Oh boy... Jean was smarter than you... and you were smarter than me... I don't like this progression. Heh. 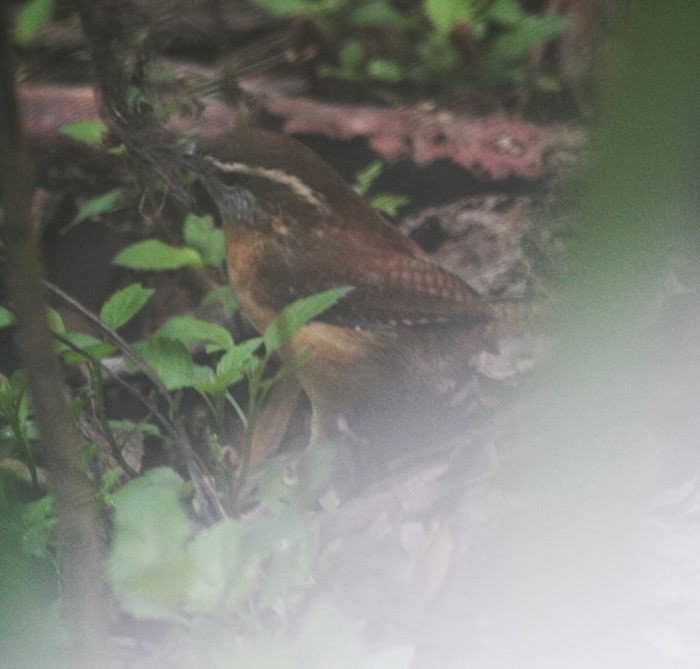 The wrens we have here in Missouri are fun to watch. They return to the same place every year to make their nests. We had one that nested on top of the garage door opener for several years. They would get used to the noise of the door opening and not fly away. And one nested inside the screened-in porch for many years. They would make or find holes in the screen to get in and out. The problem came when the babies were learning to fly. If they couldn't find their way out through the holes, they would stave to death. We learned to check on them every day and prop the doors open so they could escape. Even though bluebirds are the Missouri state bird, we don't see them very often. They seem to fall prey to cats more than other birds. You can't scold your cat for bringing you the wrong critter. They don't understand. "We had one that nested on top of the garage door opener for several years." That's great. Funny that they're so territorial. I read that they like lots of brush and trees as well... they're definitely getting that here. As for cats, I deliberately don't have any since they do not fit properly into the ecosystem here. They're both destructive to wildlife and carriers of disease. A few neighbors have them but they're only rarely in my yard, fortunately. I really don't want them leaving droppings in my garden beds. I know this has been answered, but I wanted to share this site. . . which I use often when trying to identify a bird here in FL. Thank you, Elizabeth, for that great website/blog. We had a family make their nest in our garage for several seasons.One cold night I took some laundry off of the line in the garage, carried it upstairs to my room and proceeded to put on an old flannel shirt. Something felt furry and I screamed and a wren flew out of my sleeve! My brother helped me get it out of my room.I think they liked the garage because my dad did is not a the kind of man who has to keep the garage as neat as the living room, so we had alot of spiders. All kinds of birds would come in and hunt. He started closing the doors because of cats on the cars, so they have moved out. They are still around, tho. My sis-in love in GA had one make a nest in a hanging basket in her green house. They like people. That would've stopped my heart - great story.